In the eastern part of the Macau peninsula are a number of interesting historical sites. 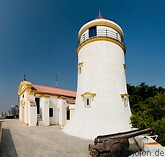 The Guia fortress, built between 1622 and 1638, lies on the highest part of Macau and has a 15m tall lighthouse. St Michael is a catholic monumental cemetery with several richly decorated graves and and a chapel. The Lou Lim Loc gardens are classical Chinese style gardens with pretty pavilions, delicate terraces, towers, ponds, bridges and winding corridors.